Diverse interests, from Muslim groups to CLA, have combined to ask the government to delay its latest tranche of terror laws to allow more consideration and consultation. The Australian Government has an important duty to protect the community from terrorism. At times, laws can legitimately limit the rights of individuals for the purpose of countering this threat, provided the limitations are necessary and proportionate. In fact, national security laws and the protection of human rights share complementary goals; both are concerned with protecting Australians from harm. 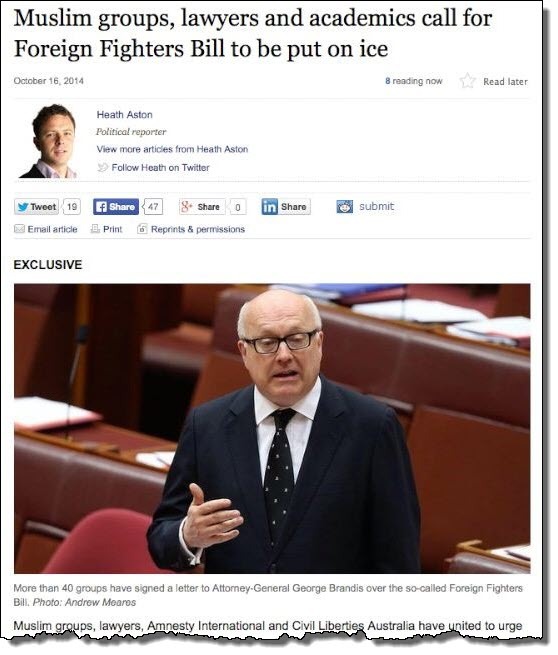 The Counter-Terrorism Legislation Amendment (Foreign Fighters) Bill 2014 currently before the Senate proposes many significant changes to Australia’s counter-terrorism laws. The stated aim is to improve the Government’s ability to respond to the threat posed by Australians who return from overseas after fighting in conflicts or training with terrorist organisations. The Government is seeking to rush this law through Parliament by the end of this month. Doing so will deny our elected representatives and the community the opportunity to fully debate the proposed changes. The Government must explain why all of these changes are needed. Australia already has laws to meet the threat posed by foreign fighters. Indeed, the Government and its agencies have formidable powers to combat terrorism. In light of this, it is not clear why some of the changes in the Bill are necessary, particularly where they could have a major impact on the human rights of every Australian. Additionally, aspects of the Bill are not urgent and do not address the threat posed by foreign fighters. The Bill extends the sunset clauses for existing counter-terrorism regimes relating to control orders, preventative detention orders and ASIO detention and questioning warrants. These regimes risk encroaching on rights to freedom from arbitrary detention, free speech, movement and association, without specifically addressing the threat posed by foreign fighters. In any event, none of these regimes is due to expire until the end of 2015. The aspects of the Bill that specifically target foreign fighters contain new offences, such as the offence of travelling to declared areas, which effectively reverse the onus of proof and threaten the right to a fair trial and the presumption of innocence. Another new offence of advocating terrorism threatens the right to a fair trial and the right to freedom of expression. Given the extraordinary nature of this Bill, the undersigned call on the Australian Parliament to not pass the Bill without a more comprehensive public consultation on the necessity of the laws and their compliance with domestic and international human rights obligations.